1st grade Ipe wood is perfect for wood decks, porches, docks, furniture, fencing and more. Ideal for residential and commercial applications, Ipe wood is an exceptional alternative to pressure treated pine and composite decking. Ipe wood is naturally resistant to rot and decay, is eight times harder than California Redwood, and has the highest rating for termite resistance. Our Ipe wood is warehoused in an environmentally protected building. Beware of those who mix Ipe with Cumaru or try to pass “B” grade as premium or 1st grade! Over the years, architects, designers, developers and builders with distinguishing taste have selected Ipe over pressure-treated wood and other traditional building materials for many building projects because of its many unique features. Prized for properties such as durability, stability, natural resistance to decay, wet conditions and insect infestation, Ipe has a Class A fire rating – the same as that given to concrete and steel. It’s natural beauty marries well with other woods and it requires minimal maintenance to keep the rich, reddish brown color. Versatile and ageless, this wood pays for itself in the long run. 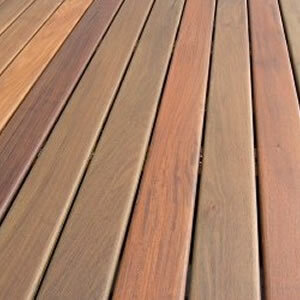 Applications for Ipe include decks, docks, furniture, flooring and fencing. Teamed with stainless steel cable rails and low-voltage lighting, Ipe brings outdoor living areas to a new level of beauty. Base shoe/end cap 3/4″ x 1 3/16″ $2.75 lf – .33 lbs. Post Cap 1 1/2″ x 5″ x 5″ (sm.) $24.95 ea – 1 lbs. Post Cap 1 1/2″ x 8 1/2″ x 8 1/2″ (lg.) $29.95 ea – 1 lbs. Outside Corner 1 1/2″ 1 1/2″ $2.95 lf – .33 lbs. Subrail – Top 3/4″ x 3 1/2″ $3.50 lf – 1.5 lbs. Subrail – Bottom 5/4″ x 2 1/2″ $3.40 lf – 1.5 lbs. Rail Cap 1 1/4″ x 5 1/4″ (lg.) $8.99 lf – 2 lbs. Rail Cap 1 1/2″ x 3 1/2″ (sm.) $7.99 lf – 1.5 lbs. Spindles 1.5″ x 1.5″ x 36″ (lg.) $7.75 ea – 1.5 lbs. Spindles 1″ x 1″ x 36″ (sm.) $6.95 ea – 1.0 lbs. Tongue & Groove 3/4″ x 3 random lengths (8 – 20′) $3.15 lf – 1 lbs. Tongue & Groove 3/4″ x 5 random lengths (8 – 20′) $4.30 lf – 1lbs. With an Ipe Clip hidden deck fastener (we recommend the Ipe Clip Extreme), your deck surface can be free of nail or screw holes and it will also speed installation time. The bottom legs of the Ipe Clip fasteners preset the gap spacing between deck boards, giving a uniform gap spacing throughout the deck. The stainless steel screw is driven either straight through the fastener into the joist, or at a 45 degree angle through the fastener, through the deck board, and into the joist. The next board then slides onto the other half of the Ipe Clip fastener that is exposed. 1 5/8″ Stainless steel screws (100 pc box) $16.50 – 1 lbs. 2 1/4″ Stainless steel screws (100 pc box) $16.50 – 1 lbs. Bowrench $54.95 – 10 lbs. Anchorseal end grain coating $20.95 qt – 5 lbs. Messmers’ UV Plus Finish $54.95 gal. – 10 lbs. Messmers’ Refinish $21.50 gal. – 10 lbs. Penofin Preservative $59.95 gal. – 10 lbs.